Risedronate is used to prevent and treat certain types of bone loss (osteoporosis) in adults. Osteoporosis causes bones to become thinner and break more easily. Your chance of developing osteoporosis increases as you age, after menopause, or if you take corticosteroid medications (such as prednisone) for a long time. Read the Medication Guide and, if available, the Patient Information Leaflet provided by your pharmacist before you start using risedronate and each time you get a refill. Follow the instructions very closely to make sure you absorb as much of the drug as possible and reduce the risk of injury to your esophagus. If you have any questions, ask your doctor or pharmacist. What conditions does Actonel 150 Mg Tablet treat? Upset stomach may occur. Although uncommon, mild flu-like symptoms (such as fever, tiredness, muscle aches) may occur within several days of taking your first monthly dose, but usually last less than a week. If any of these effects persist or worsen, tell your doctor or pharmacist promptly. 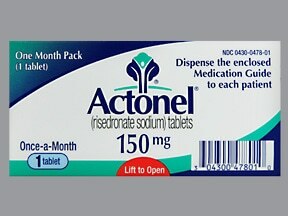 List Actonel 150 Mg Tablet side effects by likelihood and severity. Before taking risedronate, tell your doctor or pharmacist if you are allergic to it; or to other bisphosphonates (such as alendronate); or if you have any other allergies. This product may contain inactive ingredients, which can cause allergic reactions or other problems. Talk to your pharmacist for more details. What should I know regarding pregnancy, nursing and administering Actonel 150 Mg Tablet to children or the elderly? Does Actonel 150 Mg Tablet interact with other medications? Should I avoid certain foods while taking Actonel 150 Mg Tablet? If you miss your dose when you first get up for the day, do not take it later in the day. If you miss a dose and next month's scheduled dose is more than 7 days away, take the missed dose the next day when you first get up. Then resume your usual dosing schedule. Do not take more than 1 dose within 7 days. This medicine is a blue, oval, film-coated, tablet imprinted with "RSN" and "150 MG". Are you taking Actonel 150 Mg Tablet? 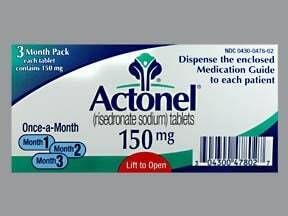 Are you considering switching to Actonel 150 Mg Tablet? How long have you been taking Actonel 150 Mg Tablet?